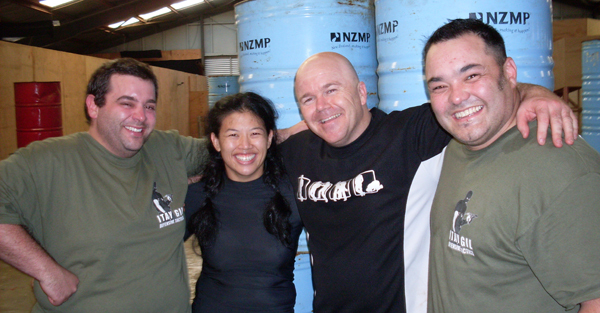 Here’s a quick introduction to the team of IKI NZ. Bryan : I have studied/trained in Aikido for 20 years before discovering Krav Maga! In Aikido I have graded to a 2nd Dan in Kyu Shin Do Aikido and was lucky enough to be the first NZ’er to be graded by the late Sensei Foster (7th Dan) in the art of Aikido. I have since trained with Tactical Krav Maga (Graham Lockhart) for the last four years and obtained Advanced Civilian Instructor rank in Krav Maga in 2010. Jimi: I have always been fascinated with self defense and trained for a few years in Shinryukan Aikido under Takase Sensei before rep rugby commitments unfortunately meant that training had to give. I dabbled with other systems a little over the years since those days but nothing really captivated until Bryan turned me on to Krav Maga and I haven’t looked back since! Over the last 3 years training under the Tactical Krav Maga System, I’ve also certified as an Advanced Civilian Instructor in 2010. Krav Maga is like no other system – it’s real training for real world conditions. If you are looking for something to take you out of your comfort zone and give you the tools to react, improvise, adapt and survive – look no further! Stephen: I’ve been training in Krav Maga for the last four years. Last year I qualified as an Advanced Civilian Instructor in Tactical Krav Maga. My teaching approach consists of two elements: fun and hard work. To me this makes learning and training a lot more enjoyable for everyone. What I love about Krav Maga is that the techniques are simple to learn, understand and develop. Paulina: I’ve been training in Krav for the past few years, graded as an Advanced Civilian Instructor and still love it. Unlike the other guys I have no history in any martial arts before starting, so was a bit worried when I first started out with guys that have had previous experience. But Krav is very quick and easy to pick up and apply. And before you know it, you’ll be rocking out with the best of them. I also have an interest in general health and fitness and have recently certified as an ACT Personal Trainer.